TheRustedChain - The Blog: Smart moms rock. And I try to be smart sometimes. Plus also, I'm kinda slow. But I have this rule, started several years ago, that the kids use only one cup a day. I remember the days when there would be 15 or so dirty cups piled up in the sink. It irked me somethin' awful! Oh I remember that like it was yesterday! Okay so I'm not the best at enforcing the rules. But the idea is that they use only one cup a day. They are to remember which color they chose and reuse it over and over. And most days it works. If they get another cup out, I string them up by their toenails. But she piddles when she gets excited so don't pay her too much attention. Click here to see what people are hooked on this week. Lilo is a doll! And your camera skills are wonderful. I've never touched up any of my photos. Which software do you use to edit them? We have the same cup rule here. Of course, the "kid friendly drawer" is baby accessible so the 1 year old gets quite a few out during the day... but he only gets juice in one, darn it! Same rule her for MY TRIBE! Kisses to Lilo MUAHHHHH! Oh man, the cup thing! That is my number one domestic pet peeve right now. I have also told my daughter, what seems like a gazillion times, that she only needs to use one cup a day. She mostly remembers, but the really guilty one is my husband. He has multiple cup-itis, LOL!!! 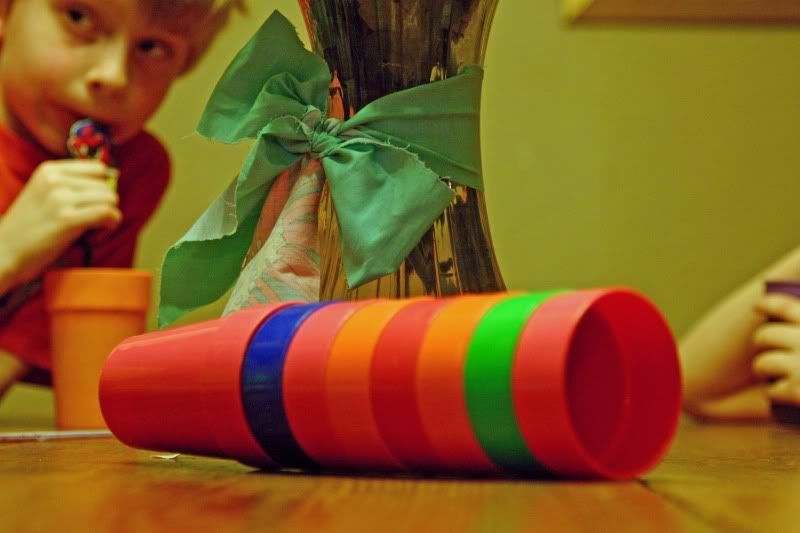 Have you considered putting the cup on a bungee and attaching it to the kiddo? Then thay can't say that they lost their cup. don't get ms started on those dang cups. My sink looks like I hosted a cocktail party for 40 all before 8am. If you only knew what my sink looks like at the end of a day with 6 kids under 4. WOW. I feel your pain! I feel your pain. The top rack of my dishwasher is always jam-packed with cups before the bottom has even one plate, knife, fork or spoon in it. Have to say...I love Jack Johnson. Thanks for the tunes! Lilo is TOO sweet! I want to give her a squeeze with the big, adorable eyes!!! Same rule here! 7 kids. Lots of cups. The rule is frequently ignored. The cabinets will be bare, and you can hold up every one of the 15 cups on the counter and ask whose it is, and nobody has a clue. Cep for me. I only use one, and I always know where it is. Until someone else steals it because they've gotten confused. Love the 1 cup per day rule, we have to same one. OH my Lilo is so cute!! Look at those droopy eyes! I have the same rule in the summer. I babysat and they each got a cup with their name on it each day. It made it easy to figure out who's cup was who's. I do the cup thing too...great idea! Eventhough I only have 1 little one right now, hopefully the rule will stick when we have more. By the way, Lilo is the cutest thing ever! 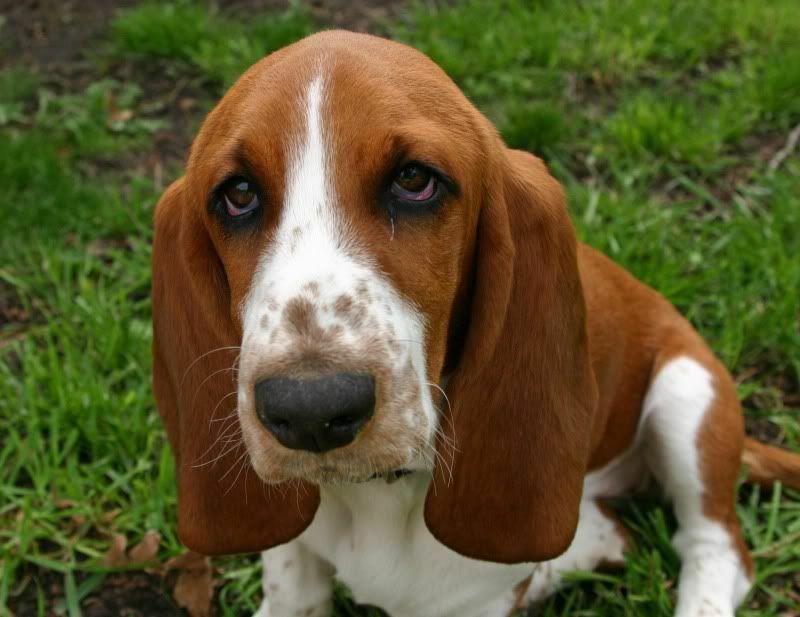 I received a basset hound for my b-day when I was 3, Sally and it was a rough day when she passed away when I was in the 8th grade...they are such sweet dogs and adorable! Love the bread...they will always have a special place in my heart. Good rule-we never follow it! I need some rules about laundry. Or an extra machine? What soulful eyes your little Lilo has! Loving them! My girls had their special cups too. Love the shot of the dog..good pictures.. The one-glass-a day rule is a good on. I'll have to enforce it with my hubby!! Thanks for checking out our Hooked on Fridays post. As you read, we're complete blog addicts too! !